In June 2016 at the beginning of a four-month expedition along the eastern Pacific Ocean, the Ocean Exploration Trust’s Exploration Vessel (E/V) Nautilus completed the “Seeps and Ecosystems of the Cascadia Margin” cruise between Victoria, Canada and San Francisco targeting methane seeps, shipwrecks, and coral and sponge communities. During this survey, Olympic Coast National Marine Sanctuary (OCNMS) was allotted one 12-hour dive using the Nautilus’ Remote Operation Vehicle (ROV) Hercules. In support of long-term seafloor mapping goals of OCNMS and partners, this dive covered diverse ecosystems at the head of Quinault Canyon, specifically to dive on surficial geology targets (Fig. 1) and characterize the seafloor habitats mapped in May 2016 by the NOAA Ship Rainier. Visual surveys with the ROV provided seafloor substrate ground-truthing and resolved questions about varying sonar backscatter image interpretation. Rock samples were collected to guide geological evaluation. Figure 1: The survey design for the E/V Nautilus Remote Operation Vehicle (ROV) Hercules with six target areas. Known methane seeps (blue) surround the transect line (orange) for the survey which characterized the sonar backscatter for the Quinault Canyon rim. In transit to the ROV launch site, sub-bottom profile data were collected along a transect that traversed six target areas defined for ROV work. Nautilus’ crew launched Hercules at Target Area 6 and progressed northward to cover as much ground as time allowed. These are the first images of the seafloor and biota obtained from the area. Sonar data from the Rainier indicated potential rock ridges, boulder fields, surficial gravel deposits, sponge reef habitat, and sand waves. On visual inspection, high reflectance areas were found to be late Pleistocene (>10,000 years ago) deposits of gravels partially buried by younger Holocene sediments. Sediment samples verified that these gravels were rounded, typically caused by water flow in rivers, thus likely transported and deposited by melting glaciers. Overlapping this high-reflectance area on the east is the northern extent of the Mid-Shelf Silt Deposit (MSSD), also related to late Holocene Columbia River sediment deposition. Dive logs and video documented fish, invertebrate and sponge species. Additional focus was on sample collection for eDNA analysis, close up imagery of carbonates forming hard substrate, and demersal fish in or near methane seep habitat. 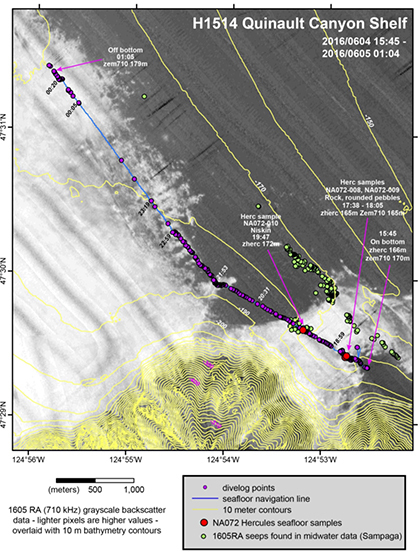 Figure 2: Final image of completed ROV transect shows the Quinault Canyon bathymetry, grayscale backscatter data, divelog points where video and photo documentation were captured, seafloor samples, and methane seeps. At Target Area 6 rock samples collected in the high reflectivity area showed rounded pebbles in sand/gravel thought to be the result of river deposits or weathered anticline. 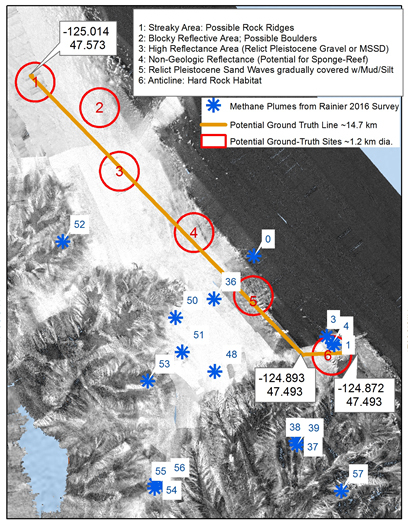 A transit between Target Areas 5 and 6 showed glacial erratics, sand waves, and sparser fauna than previously observed. The high reflectance (light areas) of the seafloor correlated with glacial erratics and the low reflectivity (dark areas) with mud/sand sediment (Fig. 2). Hercules found low visibility because of the density of krill in the water column. Sediment and dark green biofilm coated a granite rock sample from this area. Sea cucumbers, sea anemones, sea stars, sea pens, rockfish, shrimp, sponges, hard coral colonies, sea urchins and bivalves were all abundant. In the transit between Target Areas 4 & 5, wind and eastward water currents prevented the survey from completing its mission.